Bad idea for a 18 year old? Well, the more and more I search for places that hire at 18 the more and more I realize no one does as far as trucking goes. I however did find a job at a auto-parts store delivering parts around town. It may not be a 18 wheeler but at least it will give me some experience outside of fast food or retail. Thoughts? I think at this point what I may do is start putting some feelers out to companies in the area that are or might be hiring. And talk to either some recruiters or management to see what may or may not be available for someone my age. Its possible I may have to put this off until i turn 21-23. But I guess we'll see. David, I don't want to ignore your post since you're the author of this thread. In all seriousness, I know you didn't come here seeking a guidance counselor or advice for 'life,' but just be weary of anybody saying you have to go to college just because you should. You sound like a very responsible young man, and an educated one for that matter. I applaud the respect you have for your parents and your sense of independence and personal responsibility. Brett gave you sound advice. I wish you the best. Hah, no worries, I may not have come seeking advice on life, but the fact is I'm 18. Guidance is never something that I don't want, frankly I've always found the school system a utter waste of time. Even being home schooled I find that the school system is utterly broken, luckily I had my mom around to teach me the finer points of morality, humility, and common sense that people seem to be lacking nowadays. The truth is I don't really have any interest in going to college at this point in my life, it doesn't have so much to do with convenience so much as like it was said before, unless you go to a trade school and learn real world skills, its just a piece of paper. And like you said, if its about knowledge or making yourself a smarter person get a library card. If I do go to school one day it'd likely be for something like computer repair, computer networking, and possibly get a associates in applied science (of course i'd need to brush up on the o so important college math skills but whatever) But frankly I see that more as a hobby than I do a career. I love computers, I love computer games, but I need to get that part of my life behind me for awhile and move on with my life. But anyway, back to trucking, as far as getting a job right out of CDL school, I've read about pre-hires. How do I go about trying to get these? 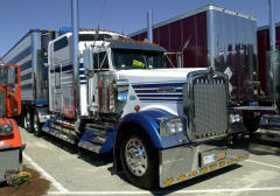 Is it as simple as throwing applications / resumes out to various trucking companies in my area in the interest of getting a pre-hire and then go to school? Or do you typically need to be in the process of getting the CDL beforehand? I'd be more than willing to get a job at UPS, Fed Ex, Coke, etc etc. But I'd still need a CDL to drive, and unlike the trucking business you don't really have the option of prehire's. So if I did try to get on with one of them and couldn't...that could be a issue, I'm sure I could find a job somewhere here in-state but anymore info or advice on getting into the industry would be appreciated. Trying to learn all I can before I dive head first into this. Also, the retailer Target has a distribution center like a hour from my house, and Frito lay has a plant in my town, perhaps those could be options aswell? You can drive within the state, at your age. So you could get into trucking....You don't say where you live, so I can't give you any pointers on how to check, or where, about gaining employment after you finish school. Alot of community colleges offer a CDL school, so thats something to check into. If you can't find a job driving until you are older, check into working for FedEx on the docks, or UPS, or even Pepsi, or Coke. They can hire their drivers from within the company, so you could ride along and lump crates, and get the feel of trucking that way. You have alot of possibilities...so check them out !!! And Welcome to TT !!!! Glad you found us....stick around, theres lots to learn here !! First thanks for the reply, I apologize for not listing my state etc at first, never even thought to do so. Currently i reside in Topeka Kansas, as for Fedex and UPS etc, I hadn't thought of that, from what I've read people say its worth getting a CDL even if you don't start working in trucking right away, would you agree? Also do you have any recommendations on where to get a CDL? I've read that its better to get a CDL from a Company instead of a community college or some other source. Thoughts? Well, I just recently finished High School (Homeschooling) and have been trying to decide what I want to do with the rest of my life. I'm looking for a good job, and frankly trucking has always had a high appeal to me. Not as a little kid thinking big trucks are cool, but as a person who simply believes they would enjoy the lifestyle. I don't know if I want to do trucking for the rest of my life or not, but even if I only did it for a couple years I would at least be able to put myself through college to complete my general education and figure out what else I may want to do. I'd just go to college now, but frankly i'm not too much of a fan of having my parents put me through my first two years of community college, or of having a huge amount of student loans to pay off right out of school. My dad's a retired USMC vet, and has major back issues (degenerative disks in his back) so i'd prefer to support myself as much as possible out of high school and trucking seems to me the best way to do so. And like I said, I've always wanted to take a stab at it, essentially my question is, what are my chances of being hired by a company at 18 to do in-state hauling with a class A CDL? I know you can't do OTR until 21 under federal law, but I assume you can do in-state under 21. Any tips or advice that can be given is appreciated, thanks for your time.